Many people can be called upon to support a mother in the throes of labour. There is informal help such as spouse, mother or friend. Then there is formal help such as a medical doctor, nurse, midwife or a birth doula. Back in the day the process of giving birth was quite simple, just a mom, a doctor and maybe a nurse or two. Dad-to-be’s were not even allowed in the room. Now, in modern times it is quite common for moms to have a vast support team while giving birth. The term doula was first used in a 1969 anthropological study conducted by Dana Raphael. In the 1970’s Raphael suggested it was a widespread practice that a female of the same species be part of childbirth and throughout the world, this role was typically filled by a family member or friend. Raphael derived the term from modern Greek meaning servant-woman. Raphael also described it as coming from Aristotle’s time. 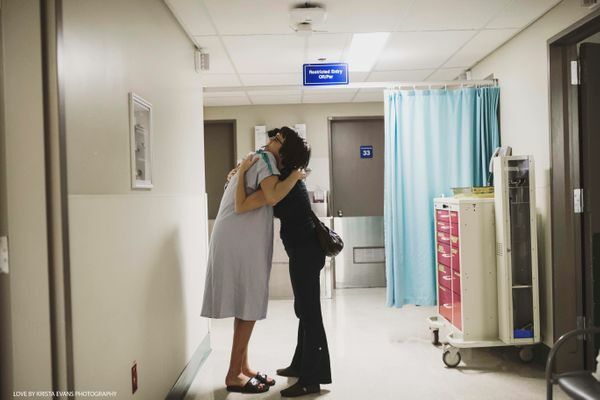 A duo named Marshall Klaus and John Kennell conducted clinical trials on the medical outcomes of a doula-attended births, and then adopted the term to refer to a person providing labour support. The modern age doula started as a practice used only in America, but has since spread out throughout other countries. It has become a popular choice for many moms-to-be. Now, we could sit here and explain the benefits of a doula (and we will), but a picture speaks a thousand words without making a sound. 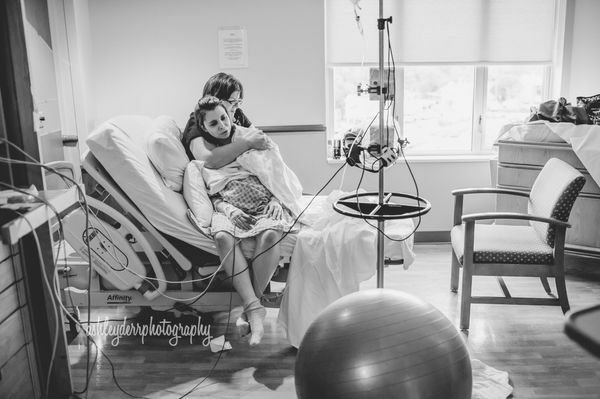 Here we will look at 15 pictures that show the true beauty and power behind the doula. 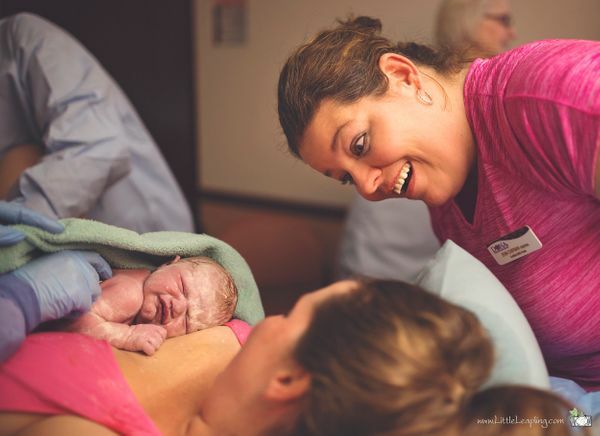 A doula is also known as a birth companion or post-birth supporter, and that really does define the relationship with two words; companion and supporter. As you can see in this photo, the doula is there to hold your hand through it all. They are there to offer support and guidance to you as you embark on one of the most difficult journeys of your life. Part of their role in your labour journey is to just sit with you and keep you company. They may offer some advice (breathing or meditation techniques) or some comforting words (You’re doing great or you got this!). They may even offer a joke or too to take your mind off the pain. Throughout your pregnancy, you and your doula will have formed a relationship, and will get to know each other so that your doula will know strategies to use to assist you at this time. During labour, there are many people there to look after the mom-to-be’s physical health. There are nurses, doctors and midwives. A Doula is a great resource to make sure mom is receiving the care she needs for her emotional well-being. 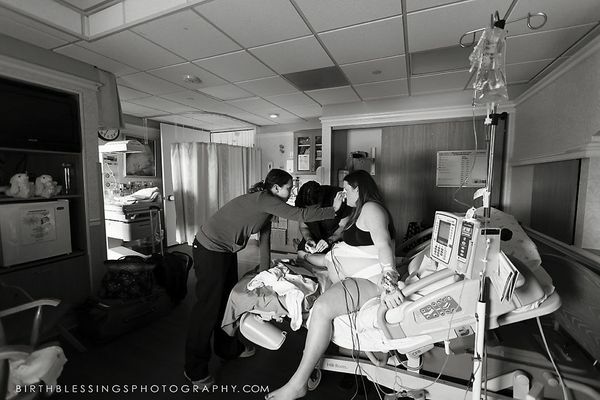 In this beautiful picture a doula can be seen gently wiping away mom’s tears. This is really what they are there for. To support mom, to tell her it is ok to cry and just to let it all out. She is someone who the mom can call on for any emotional concerns that come up during the labour. They are also a great emotional soundboard for the post-partum period. Being there for mom when she returns home with her new bundle of joy, as we know that is not easy on the emotions either. Doulas can not only calm a tearful mom with tissues, but they will also use aromatherapy, essential oils and candles to calm the senses. C-sections are becoming more frequent in the USA, at nearly 1 in 3 women requiring major surgery to get the baby out. 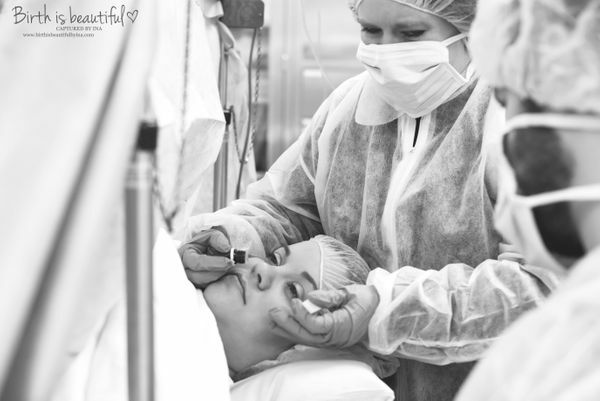 Doula’s can play an important role in a C-section. A doula can be a great resource to have when preparing for a C-section, she can inform you of details of the procedure and answer many questions you may have about the upcoming procedure. During the procedure, the doula can answer any questions you have about what is going on. She can be your eyes and ears in the operating room while everyone else is busy. She can take pictures for you, or even use her skills in aromatherapy for you (as we can see being done in the picture). One of the best reasons for having a doula during a c-section is that after the baby is born, the dad usually goes with the baby and mom is left alone on the table being repaired. Not if you have a doula. The doula stays by the mom’s side at all times and can be vital in updating mom about any updates on her baby. During childbirth, there is always that moment when a mom thinks that she just can’t do it anymore. The doula is the one there, pushing the sweaty hair off her face saying you can do this! She’s a great cheerleader. Another great benefit of having a doula is that she knows all about different positions to ease labour pains. She can tell you when to change positions, which positions to try or even guide you through some gentle stretches. Or, she can even just be the one to hold your hand, wipe hair off you face and guide you through the pain. Cheering you on! She can give mom some gentle massages to ease pain or discomfort. Doula’s are a great asset to have during a home birth, where child birth is done au natural. This is when positioning and breathing become very important in controlling pain. A calm mom is one who is better able to power through. Breastfeeding can be intimidating for first time moms, or even veteran moms as no two babies are the same. A doula is a great person to have by your side postpartum when you are starting your breastfeeding journey. Here are some statistics, a nursing woman with a doula were; less likely to experience a delay in their milk coming in and 68 % of women receiving doula care were able to breastfeed at 6 weeks, compare to 54% that didn’t have doula care. 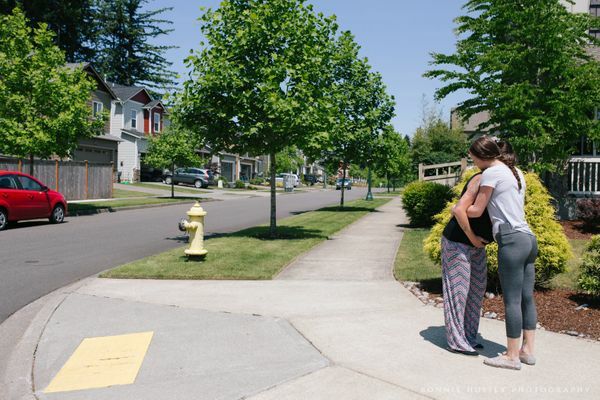 They aren’t really sure why breastfeeding is more successful with doulas, but they suspect that it has something to do with doulas encourage and assisting moms in having births more breastfeeding friendly. A doula is knowledged in the area of breastfeeding and offers the new mom some practical tips and tricks to getting the hang of breastfeeding. This is all part of the postpartum care a woman receives when she goes with a doula. A doula is there for mom every step of the way, literally. This picture depicts a mom-to-be and her doula on their third round around the block trying to progress labour. It is a beautiful depiction of mom needing a break and having the arms of her doula to lean on. When a mom chooses to labour naturally, she does not have the added help of certain medications to assist in speeding up labour. A doula is a great source of comfort and tricks to naturally speed up the labour process. A doula is a great source of comfort physically, being trained, they are aware of certain pressure points that a doula can press on to relieve some comfort. A skilled doula’s hands can even help a mispositioned baby make its way through the pelvis and directly into mom and dads arms. A much better alternative to medical intervention. Another wonderful thing about a doula is their ability to stay impartial while being very close to mom. A doula has the power to stay calm and focused, which can be hard for present family members. Spouses and family members are overcome with their own emotions and will not be as able to remain as calm as your doula. Due to the personal connection family has, if they are faced with a medical problem, they may not be able to think clearly to answer. A doula is able to stay clear headed and handle any medical concerns that arise. When we are stressed, we are usually not able to think clearly and make a rational decision, a doula is able to see through the fog and relay information to the birthing mom and her family in a clear way and assist them at reaching a decision. Pre-birth the mom will have expressed her wants to the doula, and the doula will have these in mind when speaking with mom during childbirth. 1. You cannot hurt my feelings (that is a very good thing)2. I won’t lie to you in labour (we all want the truth during labour, no sugar coating)3. I will do everything in my power so you do not suffer. (just insert smiley face here)4. I will help you to feel safe (thank you)5. I cannot speak for you; but I will make sure that you have a voice and that you are heard. I don’t know about any of you, but this sounds fantastic! This sounds exactly like the kind of support a mom needs when she is giving birth. When a mom is giving birth to her 2nd, 3rd or 4th child, she often wants to involve the older siblings on the journey. Some moms may find it uncomfortable to speak to their child about what is happening and why mom is in so much pain. For moms having a home birth and is allowing her older children to take part and watch it can be even more difficult. A doula is a great teacher for families. She can help guide and teach the older children, or dad-to-be about the process and what is happening. She can assure frightened older children that mom is going to be okay and that everything that is happening is completely normal. She can even show siblings how they can help and really make them apart of the experience. A doula truly understands that it takes a village so she will be more than happy to teach others about how to make it the most enjoyable that it can be. Looking back, I don’t think I can recall a time during my labour where I laughed. That might have been different if I had a doula. A doula is there to provide emotional support, and it is very true that sometimes laughter is the best medicine. Maybe not in the throes of a full-on contraction, but those times in between when you are just waiting can go on forever. A doula and mom will have built a relationship throughout the pregnancy, so by the time the baby is ready to enter the world they will know each other very well. A doula will learn what helps a mother, whether it be humming, singing or telling jokes and laughing. She can call on these bits of knowledge when it’s showtime to help distract mom and bring comfort. Whether with a joke or a funny story. I think every mom would like to escape for a few minutes with laughter or just some plain old chit-chat. While it is definitely not the doula giving birth, they love our babies. Think about it, they spent 9 months with you when you were expecting. They went through all the pregnancy hurdles with you and helped you prepare for the upcoming birth. They feel a connection with not only you, but the life growing inside of you. They wonder alongside you what your little one will look like, or how big they will be. This picture is a great depiction of pure excitement on seeing the little one for the first time. If anyone is thinking of becoming a doula, they can expect to meet so many wonderful moms and little babies throughout their career. If a doula is hired to work with the mom as a post-partum doula, the relationship will only continue to grow. They will assist the new mom with breastfeeding, healing and even some work around the house that needs to be done. They will probably steal a cuddle or two in. 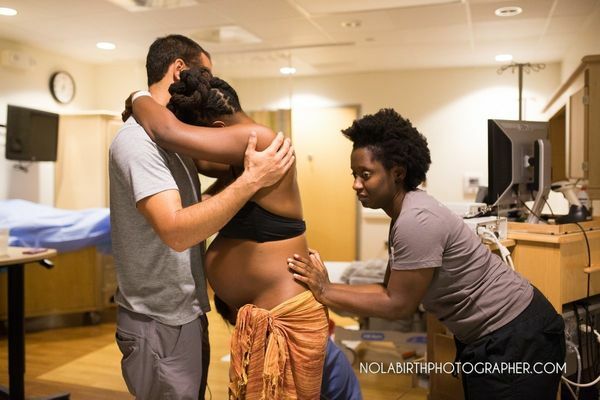 This doula literally has this mom-to-be’s back. As mom leans on dad for support the doula is providing some counter pressure to ease her pain. There are many benefits of having a doula that have been backed up by research, so for those that need to see the facts, I’ll list them below:1. Fewer C-sections2. Reduction in the use of medical intervention, such as, forceps or vacuum.3. Fewer requests by mom for an epidural4. Reduction in labour length (this is the best one)5. Increased rates of breastfeeding6. Less depression at 6 weeks post-partum. So there they are, the facts, for anyone that needs anymore of a reason to hire a doula for their next birth. Studies were done with a range of women, who had a range of different birthing situations. It was found that the moms who had both dad and a doula fared best. If I hang out with anyone for 9 months, they become a friend. Simple as that. This picture shows a new mom nursing her baby while her doula feeds her. If this isn’t a friendship I don’t know what it. I think it’s time to hear from some families that had doulas, and how their experience went. This picture speaks a thousand words. I think every mom reaches a point in her delivery where she wants to throw her hands up and say that she can’t do it anymore. That is when her doula leans over and whispers in her ear, you can do this. Another benefit of having a doula is that she really can take care of everything. When you are in the throes of labour, it will be hard for you to think straight. You and your spouse may have a hard time counting contractions or symptoms. A doula can be that record taker for you. She can worry about counting contractions while you worry about managing the pain and focus solely on the task at hand. I know I have stated it numerous times before, but there really is nothing better or more beneficial to mom than having emotional support. She can take all she can get. With a doula on hand, she won’t have to worry about anything. Well, except for actually pushing the baby, the doula does have limits. A doula is a great resource for new dads too, especially first time dads. Dads are not as lucky as moms as they miss out on a lot of bonding. Think about it, mom carried the baby and felt them move, and mom gave birth to the baby. All these things of course lead to an instant connection. A doula can help dad get that bonding time in with baby. She can assist in initiating skin to skin contact and even showing a nervous dad how to hold and handle a newborn. Having a doula may assist in calming a nervous dad-to-be while mom is in labour. 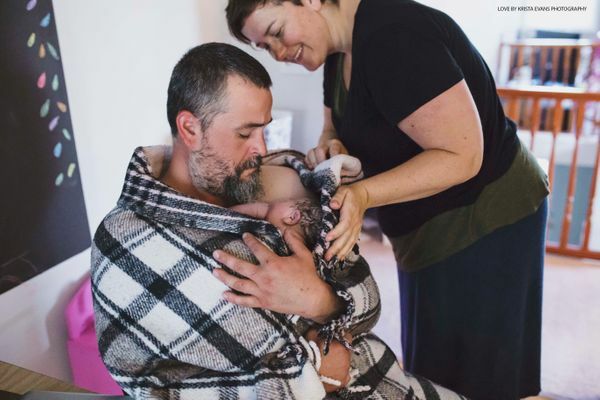 Dads want to help but often don’t know what to do and a doula can guide them in how to assist mom by applying pressure in certain areas to ease some of mom’s discomfort. Dad’s who had a doula present at birth reported that they felt more confident in their abilities by having the doulas support.